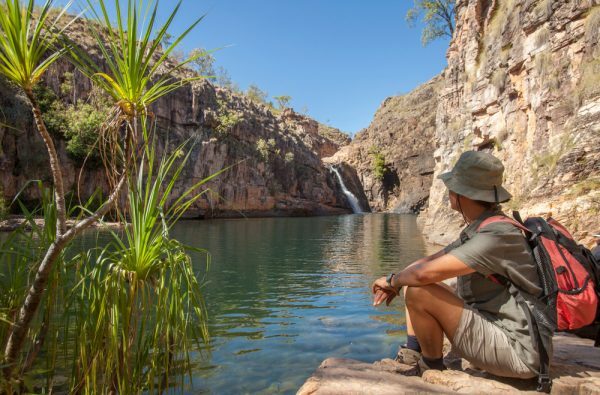 Maguk otherwise known as Barramundi Gorge will be a highlight of your trip. You won’t be disappointed by this picturesque gorge which is truly nature’s playground. 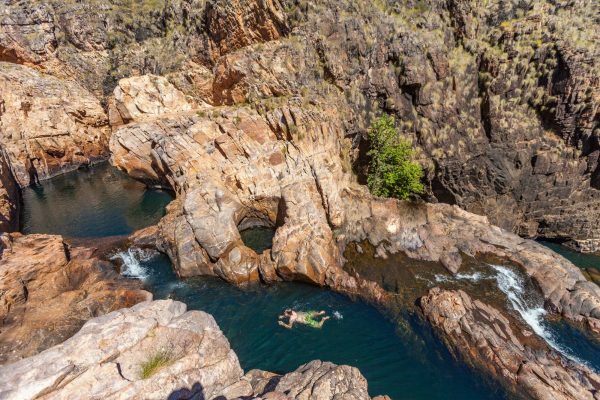 Maguk otherwise known as Barramundi Gorge will be a highlight of your trip. You won’t be disappointed by this picturesque gorge which is truly nature’s playground. The turnoff to Maguk is off the Kakadu Highway, approximately 98kms from Jabiru Township. At the turnoff it is another 12km drive on an unsealed road (4WD only). As you enter the day use site there is a large parking area and clear signage directing you to the walking track. There are also picnic tables and a basic toilet block (long drop). As you begin your hike to the gorge (approximately 2km return) you will find yourself winding your way through monsoonal rainforest along a pristine billabong. The rainforest will become less dense and the landscape will change to large boulders lining seemingly white sandy beaches. Here you will rock hop your way up stream to the enormous natural lower plunge pool of Maguk. The walk to the gorge is marked and easy to moderate. The average, reasonably fit person would find it easy. Walking shoes are recommended. Access to the pool is not as child friendly as Gunlom. As such, children’s safety swimming devices are a ‘must have’ given the pool is quite deep on entering! Floaties, pool noodles and swim jackets will come in handy! There is an unmarked track to the top of the Gorge which is a truly unique experience. From above you will find isolated rock pools perched at the top of the waterfall where you will have a breathtaking bird’s-eye view of the plunge pool below. The hike would be considered moderate to hard, fairly steep and rocky at times. Distance: Approximately 110kms South of Jabiru along the Kakadu Highway. 12 kms unsealed 4 wheel drive road. Facilities: Day use area includes car park, picnic tables and toilet block (long drop). The camp ground includes multiple campsites with fire pits, picnic tables and basic toilet block (long drop). Bring your own drinking water. Generators allowed. Camping Fees: CASH ONLY. $6.00 per adult, per night. Children camp free.